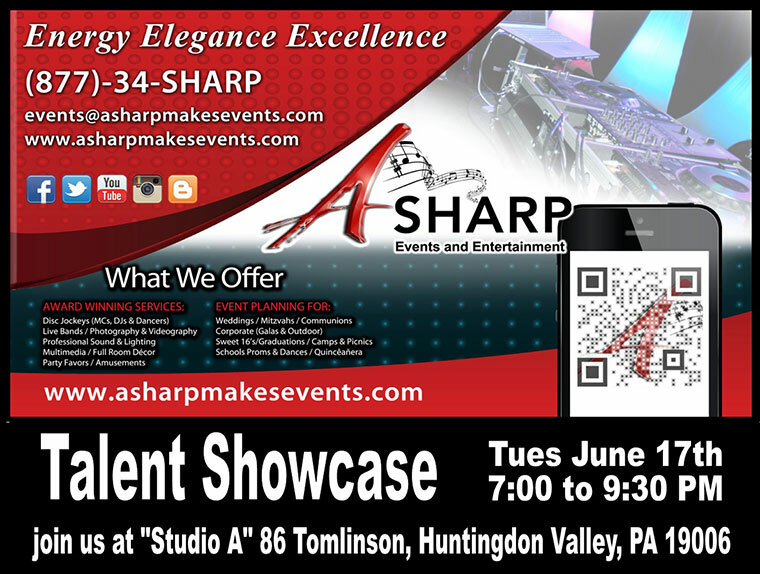 Live Showcase, Energy, Elegance & Excellence! As people of the service industry, it would be an honor to entertain you for an evening. We are here to demonstrate and educate in all areas from talent to design. Showcases are a phenomenal way to "hands on" meet and survey our expert talent and vendors for your consideration when planning your special event. AS EASY AS ONE TWO THREE ! Register today for our next showcase . additional incentives are always provided when reserving talent at the showcase. Our studio sits next to the Philmont train station. As a courtesy to our attendees joining us from from down-town Philly, we will pick up your train fair both ways for your consideration. Also shuttle you to and from the platform.